 A hairy spider, ready to eat (photo courtesy Go Bold With Butter). Chocolate sprinkles make the spider “hairy” (photo courtesy King Arthur Flour). 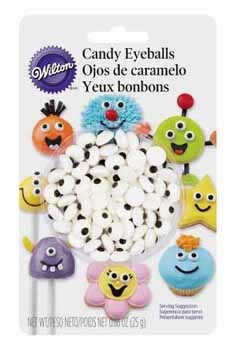 Wilton makes the smallest eyes we’ve found. These are from Target (photo courtesy Wilton). Along came a spider and sat down beside her—and she ate him! 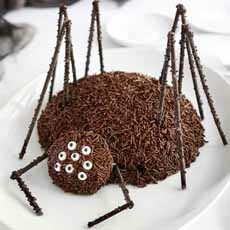 This eye-catching chocolate spider cake from Go Bold With Butter doubles as a table centerpiece and dessert. The ingredients are easy to find. Chocolate chocolate sticks for the spider legs and candy eyeballs can be found at kitchen specialty stores and online. You also use use Pocky, the Japanese chocolate-covered biscuit sticks that have good distribution at grocery stores and international markets. Prep time is 30 minutes, cook time is 50 minutes. 1. MAKE the frosting. Combine the heavy cream and chocolate in small microwave-safe bowl. Heat for 45 seconds and stir. Return to the microwave and heat again for 20 seconds. Let the mixture stand for 2 minutes; then whisk together until smooth. Place in refrigerator to firm to spreading consistency, about 1 hour. 2. MAKE the cake. Preheat the oven to 350°F. Combine first six ingredients in the bowl of an electric mixer and whisk together. Add the milk, melted butter and vanilla and beat on low until combined. Scrape down the bowl and add the egg; beat again until well incorporated. 3. LINE one well of a cupcake tin with a paper liner and fill it 2/3 full with batter (this is the spider’s head). Grease and flour 2-1/2 quart ovenproof bowl for the body (you can use stainless steel) and pour in the remaining batter. Bake the cupcake for 12-15 minutes, or until the center springs back when pressed. Bake the cake for 45-50 minutes, or until a toothpick tester comes out clean. Allow the cupcake and cake to cool on wire rack. NOTE: If you want to use the rest of the cupcake tin to bake more cupcakes, plan ahead for your batter of choice. 4. 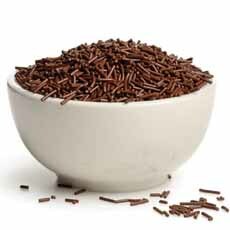 PLACE the chocolate sprinkles in a bowl. Cut the cupcake in half and cover top portion with chocolate frosting (bonus: you get to eat the other half of the cupcake). Place 8 candy eyeballs on top of the frosting. Use a spoon to cover the cupcake with chocolate sprinkles. Gently shake off excess and set aside. 6. GENTLY INSERT three chocolate sticks, standing upright on each side of spider body (do one side at a time). Use leftover frosting to attach a second chocolate stick, creating three sets of spider legs on each side. Insert two short chocolate stick “legs” on either side of spider head. Use frosting to attach two additional short chocolate sticks to legs, creating segmented front legs. 7. SLICE and serve, but only once your guests have applauded the finished cake.